'Star Wars: Doctor Aphra and the Enormous Profit' is fresh and unique, while still feeling quintessentially Star Wars – AiPT! Aphra made the discovery of the century with untold ramifications. So, naturally, she tries to sell it off to the highest bidder. The best part about the extended Star Wars universe is learning about new characters we haven’t seen on the big screen. Sure, it’s always cool to see Luke Skywalker on some adventures we hadn’t seen him in, or see what Anakin was up to between episodes II and III. But completely new characters open the door to so many new possibilities and story types you otherwise might not get a chance to see in the Star Wars universe. One such character in the Marvel Star Wars comics is Doctor Aphra, a morally ambiguous treasure hunter who uses her archeology background to score huge riches for herself. She’s flanked by 0-0-0 and BT-1, or Triple Zero and Beetee – homicidal maniac versions of C-3PO and R2-D2, respectively. 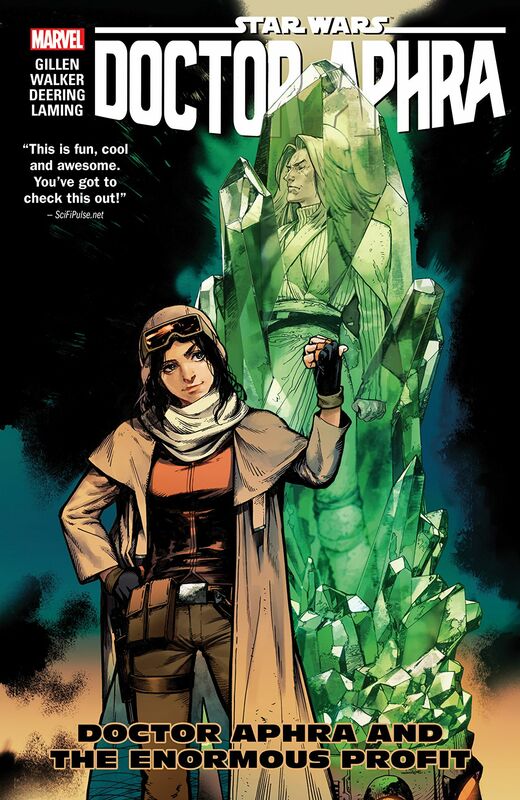 In Doctor Aphra‘s excellent first volume, Aphra came across Eternal Rur, a crystal containing the AI of an ancient Jedi whose sect of the religion, the Ordu Aspectu, was obsessed with finding the path to immortality. Pretty amazing, right? An earth-shattering discovery and could be used for untold amounts of good or evil depending on how it’s persuaded. Nah, forget that — Aphra tries to auction it off to the highest bidder, pitting rich scumbags from around the galaxy against each other for her profit. What results is a fast-paced caper that involves Aphra, her two droid counterparts, a Wookiee named Black Krrsantan who has more in common with the Incredible Hulk than Chewbacca, and even Darth Vader himself. The aforementioned Wookiee kicks off the collection in the Doctor Aphra Annual, which focuses largely on Black Krrsantan and his origin, in a Planet Hulk kind of forced gladiatorial combat. It’s an interesting way to kick off the collection, but it becomes more clear why it does later on in the story, as Black Krrsantan’s "life debt" against those who have wronged him becomes a central part of Aphra’s story. From there, writer Kieron Gillen kicks off the story in earnest, and we find out why it’s called "Doctor Aphra and the Enormous Profit." Seemingly learning nothing from the first volume, Aphra is ready to make bank with her discovery. Gillen has created a unique, funny, and oddly endearing character who’s easy to latch onto, even if she is severely lacking in the morality department. Gillen has carved out a little niche of the Star Wars universe that subverts expectations, flips the franchise’s tropes on their heads, and has fun doing it. The perfect example of this is Triple Zero and Beetee. In a later scene, 0-0-0 barters with Aphra for his freedom, resulting in a hilariously dark and ominous couple of panels when he finally gets it. It’s almost like when the Genie gets his freedom at the end of Aladdin, if the Genie was a killer droid hell bent on evil and destruction. Looming over all of this is Darth Vader, who appears at the end of nearly every issue in the collection, eager to wipe out Aphra and Rur. Vader destroyed nearly all the living Jedi, and Eternal Rur is an omnipotent AI of the ancient leader of the Ordu Aspectu, so the clash between the two is interesting to see. It’s especially enticing because it’s built up so well throughout the volume — Vader is used pretty much perfectly here. He’s not overwhelming, but you never forget about him. His presence casts a pall over everything that happens in the book. Damn, that’s some dope coloring. All of this is drawn quite beautifully by Kev Walker, who has really given Aphra a distinctive, recognizable look and feel. There’s plenty of action in this collection, and it’s all very easy to follow thanks to great panel layouts and detailed art. I’d be remiss if I didn’t shout out colorist Antonio Fabela, though — Fabela’s colors are drop-dead gorgeous in this volume. Vader and Rur finally going at it wouldn’t be half as awe-inspiring if it wasn’t for his excellent, vibrant colors. The way Vader’s red saber interacts with Rur’s green aura is some of the best coloring I’ve seen in a Star Wars comic maybe ever. It’s just so vibrant and bright, while still feeling quintessentially Star Wars. Volume 2 of Doctor Aphra is yet another hit. With Aphra, Kieron Gillen has carved out a corner of the Star Wars galaxy that’s unpredictable, fast-paced, and most importantly, a hell of a lot of fun. Volume 2 of Doctor Aphra is yet another hit. With Aphra, Kieron Gillen has carved out a corner of the Star Wars galaxy that's unpredictable, fast-paced, and most importantly, a hell of a lot of fun.